With golden, sunny days and clear, star-filled nights, Autumnfest unfolds every day across the region from September through November. Visitors old and young are invited to find their way in the Big Horse Corn Maze & Harvest Festival, running the entire month of October. The 11-acre corn maze, the largest in Southern California, will keep your family a-“mazed” for hours while additional activities include hay-rides, a corn cannon, pumpkin patch ripe for picking, kiddie rides and activities, food vendors, and pie-eating contests, among so much more. Temecula Carriage Company will offer a twist on its traditional horse-drawn wagon ride with a Halloween-themed experience aboard a Haunted Hayride. The family-friendly, but still a bit eerie, ride winds its way through spooky sites while listening to narration of the story of the Legend of Sleepy Hollow. The 20th annual Old Town Temecula Outdoor Quilt Show this October will feature quilters, vendors, a quilt walk, and quilt auctions. Hundreds of quilts will be on display in shops and hanging from balconies and buildings. 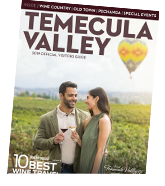 Come explore beautiful Temecula Valley Southern California Wine Country during the Fall! Book your stay in Temecula Valley Southern California Wine Country.